Since 2014, Ukrainian band The Doox has been creating contemporary music with elements of traditional songs and ethno-rock. The combination of various techniques of authentic singing, ethnic wind instruments, guitar drive and bass riffs, keyboards and percussion form a new, unexpected sound. 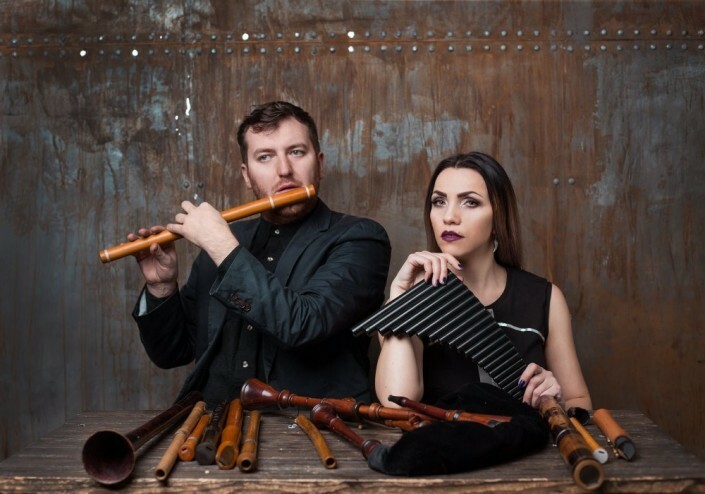 The band members are: Taras Peretyatko (bass guitar), Yulia Malyarenko (vocals), Maxim Berezhnyuk (vocals, flutes, Jaw Harps, duduk, trembita, dvodencivka, pipe, hulusi, panflute), Andrei Zholnach (guitar), Dmitry Pavlov (keyboard), Alexey Bykov (drums). A special feature of the band is the combination of female and male voices close to the traditional manner of singing. The founders of the band are bass guitarist Taras Peretyatko, keyboard player Andrey Zaplotinsky and multi-instrumentalist Maxim Berezhnyuk. The Doox musicians transform ancient Ukrainian folklore and various ethnic melodies from around the world supplementing them with modern electro and rock. The arrangement of The Doox group covers songs from all over Ukraine: Rivne, Kyiv, Poltava, Vinnytsia, Volyn regions and the Carpathians. The Doox actively participate in Ukrainian festivals. Their first acoustic album Derevo was released in the spring of 2017. "Hello! We are The Doox band, and soon we will perform for you in the square near the Baiterek monument in Astana," Yulia Malyarenko, the singer of The Doox, said. "We are happy to present our work, which includes Ukrainian folk songs. We are glad to meet new listeners - it is our first time in Kazakhstan - and introduce the Astana audience with the Ukrainian folk songs and getting to know your culture. Looking forward to seeing you," the bass-guitarist Taras Peretyatko added. Folk-project Katya Yamschikova is a band of eight musicians performing music in the style of folk. The repertoire of the group includes folk songs performed with elements of fusion rock, as well as original compositions. In 2015, the band group took part in the cultural program of events held within the framework of the SCO-BRICS summits in Ufa. Katya Yamschikova Project has been nominated for the Russian World Music Awards. In 2016 and 2017, the musicians presented Russian folk music at the International Festival of Contemporary Ethnic Music The Spirit of Tengri. "Hello everyone! My name is Katya Yamshchikova, I represent my project of Russian ethnic music. We will soon be performing at the Spirit of Astana Festival 2018. We are always very happy to come to your welcoming and hospitable region where are received with love. We are very pleased to present Russia at the Festival and, of course, to present Russian folk songs in the modern sound. We are looking forward to meeting you from July 6 to 8 in the square in front of the Baiterek monument," the folk singer said. At the Spirit of Astana on July 6-8, Astana residents and guests of the capital will enjoy the shows from 18 great bands from more than 20 countries. The musicians represent such far-abroad countries as Ireland, Burkina Faso, Senegal, Turkey, Japan, Mali, Hungary, Peru, the USA and India. Previously, the first six participants of the Festival were already announced: Marga Muzika (Lithuania), GeoTRAIN (Georgia), Kerekes Band (Hungary), Indiogenes (Peru), and musician Robert Yuldashev with Quraisy band (Bashkortostan).